Another Ghost of Granny Apples book. It's a fun paranormal mystery series I picked up years ago when the first one was free and I keep going back to it. 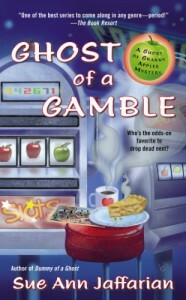 This book, takes Emma Whitecastle, who can communicate with ghosts to Vegas where she meets the mother of her mentor (and fellow ghost communicator), Milo. His mother is connected to the seedier side of Vegas's past and Emma soon finds herself embroiled in a new mystery. Another fun book and I will be continuing the series.